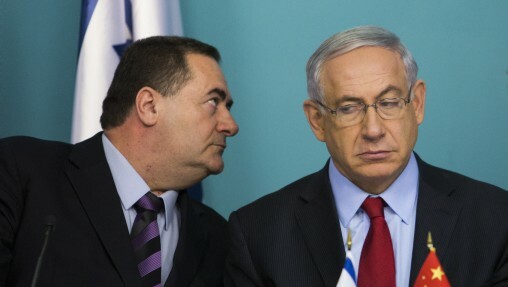 But the apogee came yesterday when Intelligence Minister Israel Katz called for the “civil targeted killing“of BDS leaders like Omar Barghouti. The phrase he used (sikul ezrahi memukad) derives from the euphemistic Hebrew phrase for the targeted killing of a terrorist (the literal meaning is “targeted thwarting”). But the added word ” civil” makes it something different. Katz is saying that we won’t physically murder BDS opponents, but we will do everything short of that. We are entering dangerous territory when an Israeli cabinet minister engages in wordplay that implicitly places a bull’s-eye on the backs of non-violent activists. If there are Israel apologists out there who dismiss the significance of such rhetoric they are sadly mistaken. In this torrid political environment in which Israeli leftists have become criminals and wounded Palestinian youth may be summarily executed in the street, it is only too easy to forsee Palestinian activists like Barghouti having a bounty on their heads. Not to be outdone, Interior Minister Aryeh Deri voiced blatant lies claiming Barghouti and other BDS activists are in the pay of terrorist organizations and nations hostile to Israel. He warned that Israel would use the full force of its intelligence services against BDS treating them as if they are terrorists. In this circumstance, and knowing Israel has engaged in serial assassinations of its enemies, it’s not hard to foresee where this could end. He again argued that BDS is not a political movement, but a group whose goal is Israel’s destruction. In this world view, there is no difference between Omar Barghouti, Hassan Nasrallah, Ayatollah Khamenei…or even Adolf Hitler. It’s truly a paranoiac state harboring a profound persecution complex. Deri also called for stripping BDS founder Omar Barghouti of his Israeli residency, which he gained in 1994 after he married an Israeli citizen. Deri claimed that Barghouti is employing a scam against Israel because his main residence is Ramallah and not Israel (though he’s pursuing, or has completed, an MA at Tel Aviv University). clearly, an Intelligence file has been opened against Barghouti along with video surveillance showing him in Ramallah. Isn’t it odd that Israeli Jewish oligarchs may have homes around the world and live in them for much of the year without losing their citizenship? Should Israel cancel his residency it will only reinforce the notion of Israel being an apartheid state which refuses to permit political debate; instead transforming it into criminal discourse. Given Katz’s ever so veiled threat against him it would be no wonder if Barghouti did choose to value his safety and live where he’s not under threat of death! Israel’s major concert promoter, Shuki Weiss, who plays a major role in combating the cultural boycott against Israel, complained at the Yediot conference that Deri’s interior ministry was demanding that international artists wishing to perform in Israel sign a loyalty oath in order to obtain a visa. The ministry immediately denied the claim. 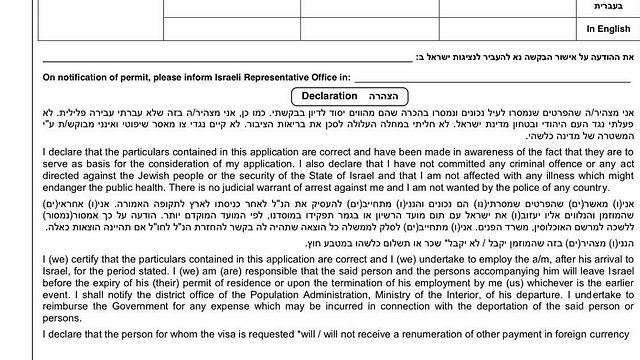 The immigration form which performers and their management must sign to visit Israel demands the artist affirm he or she has not “committed any act against the Jewish people or the security of the State of Israel.” Clearly this is a form of loyalty oath. Though countries may exclude any foreign visitor they wish for any reason, to force an international artist of Elton John’s stature to pledge that he has not acted against the Jewish people seems outrageous. On the last point, based on images of the form that have accompanied that story, the ‘loyalty oath’ was no more than a pretty normal declaration that the applicant has not committed any crime against Israel or the Jewish people and does not intend to threaten the security of the state. That’s much less than I had to sigh last time I applied for a tourist visa to USA. It’s a non-story. Let’s focus on the serious and not throw out silly allegations that are easily refuted unless proof is available. The wording of the first part is strange though. What is ‘acted against’ exactly? Why ‘the Jewish people’? Why not other people as well, if it is not specifically about Israeli’s? “Not to be outdone, Interior Minister Aryeh Deri called for stripping BDS founder Omar Barghouti of his Israeli residency. I guess to be consistent, he must also call for stripping the Israeli Residency of the half a million Israelis living in the illegal settlements in the West Bank. But I ma guessing, that like a number of zionists, he will not be consistent. I thought this might interest you (and others): French national radio has confirmed , without giving his name, that Elor Azarya is a French citizen. Palestinian diplomats might try to file a case in France. Wonder how the political Establisment with super-Zionist Prime Minister Valls (who in the beginning of March said that antisemitism and antizionism is the same at the annual CRIF dinner party) are going to react: they were very activ on the diplomatic front concerning Gilad Shalit, another French citizen. @ Deir Yassin: I just consulted a MSM French journalist who said that the French government defers to Israel in such matters. He said the French politicians will say that Israel is a nation of laws and let Israeli justice play out. They won’t want to touch it with a 10 foot pole! Unfortunately. But it’s certainly worth putting their feet to the fire. @ Paul Seligman: Sorry, but it isn’t silly at all to demand that an international artist, especially one of Elton John’s stature, sign an oath affirming that he has not committed any act against the Jewish people. Buddy, that’s a loyalty oath. What does the Jewish people have to do with Israel? Israel is a nation of Israelis. Or is a Jewish state for the entire Jewish race??? The answer is, it is not a state for all of the world’s Jewish people since almost half of them choose not to live there. So Israel has no business asking questions about whether someone has done something wrong to the Jewish people. Just today, François Hollande had to abandon his project about a change in the constitution in order to permit stripping bi-national citizens of their French nationality if they’ve been involved in terrorism. This case could have been a test …. too bad. There’s a petition on-line demanding the governement to forbid French citizens of serving in the Israeli army, this case will give an extra boost to it, I hope. I am no great admirer of Indonesia. Its human rights record is pretty bad and in Papua it is and has been atrocious. I have written elsewhere about that. Nevertheless Indonesia managed to get the UN to declare the glaringly fraudulent plebiscite that leds to its permanent possession of Papua to be legitimate. Holland shares a good share of the blame for the skulduggery that led to that UN decision. Yet however bad Indonesia’s human rights record in Papua, Papuans are, at least formally, fully fledged citizens of Indonesia with both active and passive voting rights. A few Papuans have made it to the highest offices. So Indonesia can shield itself from a “tu quoque” argument when it declares its full support for the independence of a Palestinian state as it recently did in an international gathering in Jakarta, where the commitment to BDS was also underlined. Indonesia’s President, Joko Widodo, said in his closing statement :”The struggle of the Palestinians is our struggle. God willing we may witness the independence of Palestine in our lives”. So Indonesia doesn’t want to meet Israel “under the lime tree” to borrow a simile recently used by Avnery. Holding hands in the dark is allright but in the full glare of daylight nothing doing. Netanyahu who had hoped to get full diplomatic relations with this biggest Moslem nation of 250 million people was soundly rebuffed with this. It didn’t help of course that Ratno Marsudi, Indonesia’s foreign minister, was blocked from visiting the West Bank during her recent trip to Israel. One of the nincompoops Netanyahu has staffed his cabinet with was responsible for that decision. Let us be grateful for the megalomania that leads him to surround himself with amateurs. No, she didn’t visit Israel, and it’s exactly because she didn’t intend to do so either that she was blocked from entering occupied Palestine via Jordan. The Palestinian FM went to Jordan to see her, she was supposed to inaugurate a new diplomatic office in Ramallah. It seems Indonesia and Israel have some diplomatic relations off the record, that’s at least what Tzipi Hotovely claims, when I read her ‘explanation’ about refusing the Indonesian FM entry to Palestine because she didn’t respect the diplomatic rules, I fell of my chair. Yes of course she didn’t visit Israel. That would in itself have been a sign of diplomatic recognition. When I read that she wasn’t given access to the West Bank I rather thoughtlessly assumed that this was during a trip to Israel. Acted against is intentionally vague so as to leave a door open to conflate democratic activism with terrorism. And, why did they then say “the State of Israel”, why didn’t they say “the Jewish State of Israel” or “the Democratic State of Israel” or “the Democratic Jewish State of Israel”. Ironically the people who live in Israel are known as the Israeli people, and at least 20% of Israelis are not Jewish..
As usual what politicians say and what they do are very different things. Israeli and Indonesian companies have been doing business together for many years. Of course always through a third party. No sign of BDS. A friend of mine in the Palestine support group I belong to told us about the threat to BDS members, but couldn’t remember where she had seen it or who had made the threat. In looking for information, I came across your very useful blog. I haven’t spoken Hebrew very much at all for the last 40 odd years, though I did use it a bit on a recent trip to Palestine. However, my rusty memory did a double take at the translation of “sikul ezrahi memukad” as “targeted [civil] thwarting”. I searched out my copy of Ben Yehuda’s “English – Hebrew Hebrew – English Dictionary” and its yellowing pages confirmed that “sikul” means “stoning to death”, i.e. “killing”. I understand “sikul ezrahi memukad” סיקול אזרחי ממוקד to mean “targetted killing by civilians”. I see that Dena Shunra, who apparently provided that translation is a well-established translator of the Hebrew – English language pair. As a fellow translator (French to English) I don’t like to call her translation into question, but the difference is extremely important, because, if I am right, the translation taken fromn the subtitling to the video of Yisrael Katz’ interview and copied by you and elsewhere on the web (e.g. the electronic intifada website) downplays the seriousness of the threat made by Yisrael Katz. Indeed, if my interpretation is correct, then this is not a threat, but a call to civilian Zionists internationally to kill selected BDS members. Perhaps there is a Hebrew to English translator reading this who could give a professional opinion. I would also mention that “literal” word-for-word translation generally produces rubbish, which is why I don’t believe that actual stones are involved. In any event, סיקול does not mean “thwarting” and “targeted [civil] thwarting” is not proper English! I have now listened to most of that interview and note that with the exception of that phrase, the subtitling I read, while listening to the Hebrew, seemed OK. This does make it seem that the translation error was deliberate. @Barbara: I have a MA in comparative literature majoring in Hebrew literature. I am fluent in Hebrew and do translation regularly in this blog. I have quite a bit of experience in translating complex phrases like this one and for Better or For Worse here is my interpretation: the phrase “sikul memukad” means “targeted assassination” in contemporary Hebrew. The phrase “sikul memukad ezrahi” is a bizarre neoligism/mutation, a contradiction in terms, because it essentially means targeted assassination through non-lethal (“civil”) means. There’s a deliberate obfuscation here, because the state of Israel wants to obscure the boundary between an actual targeted killing or figurative killing, that is, destruction of BDS itself or its leaders. In other words, the government wishes to destroy BDS by all means short of those that are murder. I personally believe that this takes the government of Israel far over a Red line and portends physical violence against BDS and its leaders. It is only a matter of time before this happens. But this Minister, speaking at this conference, was attempting to create some sort of distinction, no matter how flimsy, between actual murder and figurative murder.